ჰეთუმ I (სომხ. Հեթում Ա; დ. უცნობია — გ. 1271) — კილიკიის სომეხთა სამეფოს (აგრეთვე ცნობილი როგორც „პატარა სომხეთი“) მმართველი 1226 წლიდან 1270 წლამდე. იგი იყო რუბენიანების დინასტიის ბოლო წარმომადგენლის და კილიკიის სომეხთა სამეფოს დედოფლის ზაბელის ქმარი, რომლის შემდგომ მმართველობა მის ხელში გადავიდა და მანვე დაუდო სათავე ჰეთუმიანების დინასტიას. მონღოლეთის იმპერიასთან დიპლომატიური ურთიერთობების გამო ჰეთუმმა თავად იმოგზაურა მონღოლეთში. ეს მოგზაურობა კირაკოს განძაკეცმა აღწერა ნაშრომში „პატარა სომხეთის მეფის მოგზაურობა მონღოლეთში და უკან“. Amitai-Preiss, Reuven (1995). Mongols and Mamluks: The Mamluk-Ilkhanid War, 1260–1281. Cambridge University Press, Cambridge. ISBN 978-0-521-46226-6. Bournoutian, George A. (2002). A Concise History of the Armenian People: From Ancient Times to the Present. Mazda Publishers. ISBN 1-56859-141-1. Grousset, René (1935). 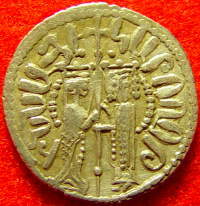 Histoire des Croisades III, 1188–1291 (French). Editions Perrin. ISBN 2-262-02569-X. Grousset, René (translator, Naomi Walford) (1970). The Empire of the Steppes. New Brunswick: Rutgers University Press. ISBN 978-0-8135-1304-1. OCLC 90972. Dobraczinski, Jan (1979). Klíč moudrosti. Praha: Nakladatelství Vyšehrad. OCLC 37577195. Toumanoff, C. (1966). "Armenia and Georgia", Cambridge Medieval History, vol. IV. ეს გვერდი ბოლოს დარედაქტირდა: 06:47, 18 ოქტომბერი 2017.